Dr UllasBatra obtained his DM in Medical Oncology from the prestigious Kidwai Memorial Institute of Oncology. He has gained widespread experience in the management of various malignancies like Lung cancer, breast cancer, GI Cancers and hematological malignancies etc. He has also done perceptorship in various International Institutes like MD Anderson Cancer Centre, USA, Royal Adelaide Hospital, Australia. He has participated as a Principal investigator and co Investigator in various phase II and III clinical trials. He has numerous publications to his credit in reputed Journals and Research gate, an online repository of scientific articles has listed 49 of them. He has actively participated in organizing various seminars, CMEs, conferences throughout country. He is also a Thesis guide to DNB residents. 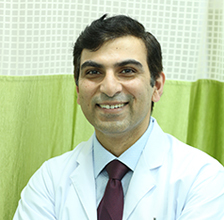 At present, he is working as Senior Consultant and Chief of Thoracic Medical Oncology at Rajiv Gandhi cancer Institute and Research Centre. Convener of The Delhi Thoracic Oncology Group. Organised the first ever BEST OF WCLC in India at Delhi in Dec, 2016. CoOrdinator for Thoracic Oncology at ICC, 2013. Principal investigator in phase III multicentre, randomized open label study to assess the systemic exposure, efficacy and safety of 450 mg ceritinib taken with a low fat meal and 600 mg ceritinib taken with a low fat meal as compared with that of 750 mg ceritinib taken in the fasted state in adult patients with ALK rearranged metastatic NSCLC. Principal investigator in multicentre, multinational, phase III study to assess the safety of RO 5185426 in patients with braf V600E mutant metastatic melanoma incurable and surgically unresectable stage III or IV. Principal investigator in : A real world open label, multicenter, prospective, non interventional study to evaluate the effectiveness and tolerability of ceritinib in Indian patients with ALK positive metastatic non small cell lung cancer patients who have progressed or are intolerant to crizotinib. BO25734"A PHASE III randomized, multicenter, two-arm, open-label trial to evaluate the efficacy of T-DM1 compared with treatment of physician's choice in patients with HER2-positive metastatic breast cancer who have received at least two prior regimens of HER2-directed therapy". ML25477: An open-label phase IV study of Trastuzumab in combination with standard chemotherapy (as per the routine clinical practice) as first-line therapy in patients with HER2 positive metastatic gastric cancer. Awarded Gold Medal in the subject of Pathology at the II MBBS examination held in the month of June 1998. Awarded Best student in Pathology by Association of Microbiologists of India, Manipal in the year 1998. Awarded Nantha Kumar Memorial Prize for the best student in pathology of Kasturba Medical College, Mangalore in the year 1998. Awarded Varwady Hegde and Hirebettu Hegde Memorial Prize for standing First in Medicine- Thoracic Medicine and Cardiology in the year 2003. Awarded Dr K P Ganeshan, Dr B M Hegde Medal for the best out going student in MD (General Medicine) for the year 2004. Awarded Best Paper for Paper titled ×´Association between CD4 count and opportunistic infection in HIV" at KAPICON, 2003. Awarded Best paper for paper titled" Indigenous developed EORTC QOL in Indian patients" at Indian Society of Oncology, Patna, 2006. Awarded Research Grant for poster presentation at ESMO 2006 held at Istanbul, Turkey. Awarded Research grant for poster discussion at St Gallens Breast conference 2007, Switzerland. Awarded Research grant for poster discussion at ECLU conference 2007 held at Lugano, Switzerland. Awarded Research grant for poster discussion at IASCLC conference 2008 held at Geneva, Switzerland. Awarded Research grant for Poster Discussion at ECLU Conference, Geneva, 2010. Goyal P, Batra U, agarwal C, et al. Efficacy and toxicity profile of maintenance pemetrexed in patients with stage IV adenocarcinoma lung in Indian population. South Asian J Cancer 2016 Oct -Dec ; 5(4): 196-204. Tiwari A, Shah S, Sharma AS, Batra U, et al. Prognostic factors in Indian patients operated for soft tissue sarcoma - a retrospective cross sectional analysis. Indian J Surg Oncology. Saini R, Batra U, et al. EGFR mutation - a commonly neglected mutation in squamous cell lung cancer. Journal of Cancer treatment and metastasis 2016:20(2);253-4. Batra U, Parikh PM, Prabhash K, et al.Practical consensus recommendation 2016 for advanced clear cell RCC. South asian J Cancer. Oct-Dec 2016: ; 5(4): 196-204. Hibare KR, Goyal R, Neman C, Batra U, et al. Radial endobronchial ultrasound for the diagnosis of bronchoscopically invisible tumor. Lung India 2017. Doval DC, Sinha R, Batra U, et al. A Report of Two Cases of LeptomeningealCarcinomatosis Arising from Gallbladder Carcinoma.JGastrointest Cancer 2015 Apr 12. Epub 2015 Apr 12. Doval DC, Azam S, Batra U, et al. Epidermal growth factor mutation in NSCLC: A single centre Experience. Carcinog 2013:12;12. Doval DC, Dutta K, Batra U, et al.Neoadjuvant chemotherapy in breast cancer. A review of literature.Indian Med Assoc 2013;111(9): 629-31. Batra U, Bapsy PP, DadhichHK,et al. An unusual case of stomach carcinoma presenting with only bone and bone marrow metastases. AJC, Jan 2011. Batra, S., Doval, D. C., Batra, U., Suresh, P., Dhiman, A. and Talwar, V. Gallbladder cancer with tumor thrombus in the superior vena cava. Hepatobiliary& Pancreatic Diseases International : HBPD INT. 2010. 9, 325-328. Atilli AVS, Jain A, saini KVS, Batra U. Orbital Metastases : A rare presentation of osteosarcoma. International Ophthalmology 2008; 28: 433-6. Kamal S Saini, Suresh V Attili, Monika LambaSaini, UllasBatra.Capecitabine-induced Hand-foot Syndrome. JIACM 2007;8(2): 144-5. Suresh AVS, BatraUllas, Dadhich H, et al. A case of carcinoma lung presenting as pancytopenia. AAJC 2006:5(3);131-2. MaalathiPrabhu, Naidu S, BatraUllas Familial presentation of SLE. JIACM 2003;4(3): 247-8.